A native Texan, Paul was raised in Houston and Dallas. After college, he was with a Ft. Worth corporation for 18 years, working his way up the corporate ladder -- he became Executive Vice-president and General Manager, and for eleven years, he ran the company. Paul became a leader in the metal treating industry, working closely with aerospace, petroleum, mining, steel and forging industries. He was on the Metal Treating Institute board of directors for eight years and their president in 1971-1972. Paul's community involvement was a love to serve others, from teenage groups, community service, member of the Ft. Worth Sports Committee, and active in his church and staying involved in his children's life. After two years of trying to buy the company he was with, it did not work out. He decided to resign in June, 1973. It was two months prior to this that he tried his hand at sculpting. After leaving the corporation he started thinking of art as a livelihood, even though he had no formal training. He was fascinated about the possibilities. He felt, with hard work and using his business skills, it just might work. Well, 33 years later, over 200 subjects have been created in limited editions and commissions from three-inches high to over eight feet in size. Paul is very thankful for the talent God has given him. He is one of America's leading sculptors -- with created works that grace prominent public displays, museums, galleries and private collectors round the world. For over a quarter of a century, he has traveled throughout the United States, Mexico and Canada making observations, sketch studies and photographs. Through his hart, Paul has helped raise hundreds of thousands of dollars for special community projects, under-privileged children's organizations and wildlife conservation. He has been written up in Peterson Hunting Annual, Southwest Art magazine, Art Gallery magazine, Sports Illustrated, Forbes and numerous newspapers across the country, and has made many radio and television appearances. He has received numerous awards for his art. "Best of Show" twice at the National Wildlife Show in Kansas City, "Silver Award" from the Texas Rangers Museum, "Best of Show" in water fowl and "Best of Show" in big game animals. Also, "Featured Artist of the Year" in Tennessee. His art has been shown in galleries from Carmel, California to the Florida Keys. 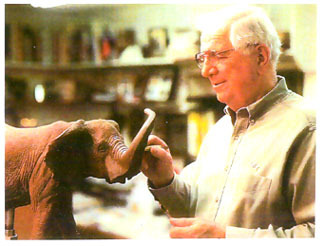 His love for wildlife and people shows in his work. Art critics have said his sculptures look as though they could move. Paul has three children and 6 grandchildren. He and his wife, Georgia, live in the Hill Country near New Braunfels, Texas.